Add a stylish garden ornament to your yard with the Achla Cast Aluminum Great Blue Heron. A beautifully sculpted great blue heron forms this extraordinary display of metal crafting decoration. The heron stands regal and proud, wings at rest and appearing ready to stride forward through your garden. This sculpture is made from cast aluminum and features a realistic verdigris finish. Place this bird statue in your yard, or use it to add accent to areas of interest. Each of the two base feet has a small hole for anchoring with the included small lawn stakes. 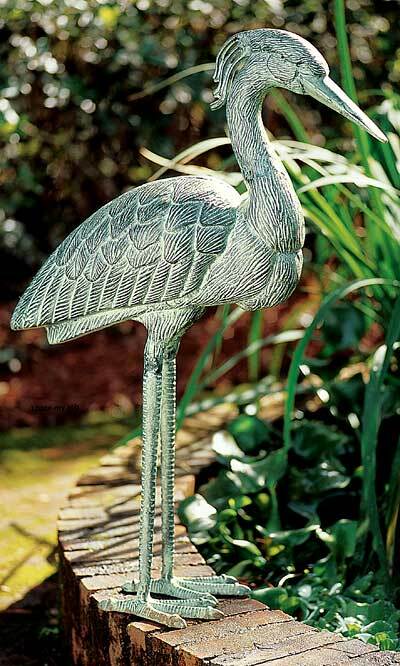 Add the illusion of life to your garden with the Cast Aluminum Great Blue Heron. Some assembly required.